Of all the trending (and trendy) topics in healthcare today, pricing transparency has grown quickly in popularity and focus. Whole companies are now committed to cracking this “secret code,” and then selling the information to us (as either employers or consumers) as a way to enable pricing comparison for healthcare services. The wisdom, of course, is that if we knew pricing we could wistfully bring “free market” influences to bear and those, in turn, would defy all logic of supply and demand or cost and value. The result would be sweeping (and desperately needed) pricing relief. As consumers, all of us could then easily shop for healthcare services in much the same way that we shop for other goods and services online. At least that’s the theory – and the hope. It’s definitely a big hope. Lot’s of intrigue here – starting with a relatively obscure (and comparatively tiny) organization with a bulky name – the AMA / Specialty Society Relative Value Scale Update Committee. Today it’s known less formally as the Relative Value Scale Update Committee – or simply RUC (pronounced “ruck”). Here’s the member list of the RUC. Membership in the RUC is reserved for “Member” Societies – by “invitation only” under terms of a rigorous Non-Disclosure Agreement. As the copyright owner, the AMA also derives a significant portion of it’s annual ($285M in 2011) revenue from CPT licensing royalties (direct CPT revenue is masked between two categories that combined account for $130M or 45% of AMA’s total annual revenue). Historically, “value” recommendations made by the RUC to CMS/Medicare have been accepted 87.4% of the time (study from 1994 – 2010 here). Private insurance companies (Aetna, Cigna, UnitedHealth, Blue Cross etc…) tend to base much of their pricing on these same code sets (PFS & CPT) which effectively makes the RUC the de-facto standard of all U.S. Healthcare pricing. The formula that the RUC uses for all it’s “value” recommendations is fairly simplistic and proprietary (including a final calculation called the “conversion factor”). That’s the public-facing formula from the AMA’s own website, but each of the individual components are completely opaque. The word value is everywhere, of course, but that doesn’t mean it’s applied to either the pricing calculation or the recommendation. Here’s one small example of where the RUC recently ran amok. 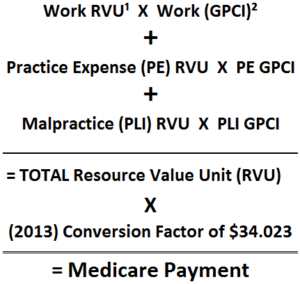 In an article from last year – “The World of Healthcare Pricing” – Gregory Warner reviewed a presentation made by Dr. Richard Waguespack to the RUC on behalf of his specialty group, the American Academy of Otolaryngology (Ear, Nose and Throat). That $13,000 markup is both endorsed and encouraged by the RUC because it’s the only billing option for the procedure. There are about 8,000 CPT codes alone. We all reference “misaligned” or “perverse” incentives and there is much work already underway to “re-align” these incentives around “value” and “patient-centered outcomes,” but if the underlying pricing mechanism is seriously flawed, how (and when) do we fix that and shouldn’t it be the top priority? Some will argue that the newly created Independent Physician Advisory Board (IPAB) was created by Obamacare specifically with power to override the AMA/RUC – but will they? The Sustainable Growth Rate (which I wrote about here) was enacted in 1998 and designed to lower the rates that Medicare pays physicians starting in 2002. Have we adhered to the SGR? Not once. We’ve avoided the SGR-mandated cuts for each of the last 10 years. The SGR accrual amount for those 10+ years is now over $300 billion – and growing. All of which begs an entire litany of questions. Aside from trying to get more pricing uniformity (definitely a good thing), what are we hoping to achieve with this new wave of “pricing transparency?” Assuming every healthcare price was published tomorrow – what then? Will that, in turn, magically influence supply and demand? Will it have any affect on rates that are often cost-shifted to support larger influences (uncompensated care and more lucrative downstream services to name two big ones)? 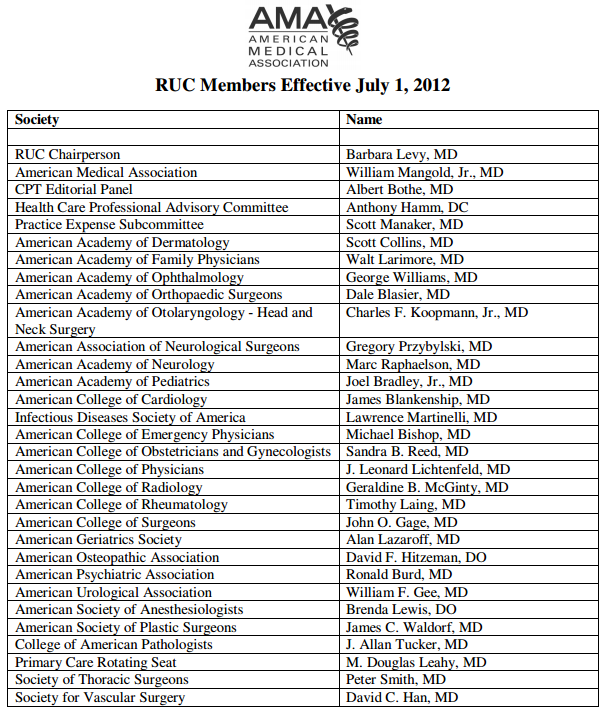 Why is the RUC membership so dominated by procedural specialists? How will IPAB succeed where the SGR has so clearly failed? 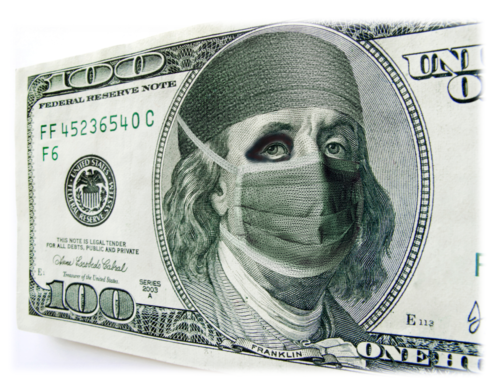 More importantly, how will pricing transparency help us in our ultimate quest for healthcare value? The list of unanswered questions is long – including this last one. Do we really need more healthcare pricing transparency, or do we need to get the RUC out of the business of secretly fabricating healthcare prices for the whole system?